Techvoice is another blogger template for blogging website. 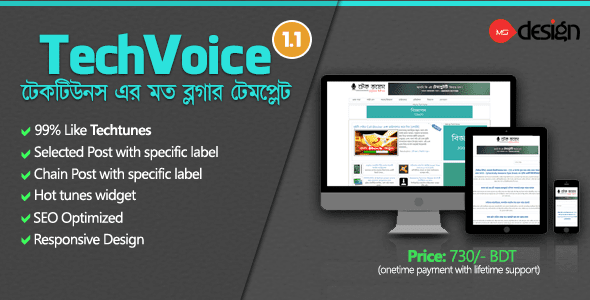 This template is 99% like the most popular bangla technology website Techtunes. You should also called this template as alternative template of Techtunes. SEO ready responsive and clean design that was designed by Muhammad Subel. Techtunes is a wordpress base largest Bangla Technology social website. I design this blogger template like techtunes. I tried my best to develop this template 100% like techtunes. That's why Techvoice blogger template is 99% like techtunes. You should sticky a post with specific label as a featured post like Techtunes. This section attract visitors attention. Most important one post you can make sticky in top. By using this selected post widget (Nirbachit Post -In Bangla) you reach one post with your targeted visitors. This is a popular post widget. Most viewed posts are shown here. In Techtunes, This widget name is Hot tunes. I used this widget in Techvice and named Hot Voice and present it on techvoice like techtune's widget. You have to need buy pro version. আমি নিজের মত করে একটা ডিজােইন করে নিতে চাই এই সাইটের জন্য http://shahoreyarmostofa.blogspot.com কি রকম টাকা লাগবে । আর আপনি কি .কম ডোমেইন বিক্রি করেন ??? ১। যেহেতু আমি ইংরাজীতে ব্লগ করছি ও ইংরাজী সাইটে ব্যবহার করব। সুতরাং এই থীম ব্যবহার করে গুগল অ্যাডসেন্স ব্যবহার কিংবা অ্যাপ্লাই করতে কি কোন সমস্যা হবে? ৩। থীমটি মোবাইল রেস্পন্সিভ কি? মানে মোবাইলে ব্রাউজ করা যাবে?? ৪। পরবর্তীতে কোন সাপোর্ট পাওয়া যাবে কি?? Free version ta mobile e web version dekhle puro ase na .at a ki mobile akdom web version thin as be? R Ami Indian ,Ami kivabe payment korbo janan?